When vertebrates run, their legs exhibit minimal contact with the ground. But insects are different. These six-legged creatures run fastest using a three-legged, or "tripod" gait where they have three legs on the ground at all times - two on one side of their body and one on the other. The tripod gait has long inspired engineers who design six-legged robots, but is it necessarily the fastest and most efficient way for bio-inspired robots to move on the ground? Researchers at EPFL and UNIL revealed that there is in fact a faster way for robots to locomote on flat ground, provided they don't have the adhesive pads used by insects to climb walls and ceilings. This suggests designers of insect-inspired robots should make a break with the tripod-gait paradigm and instead consider other possibilities including a new locomotor strategy denoted as the "bipod" gait. The researchers' findings are published in Nature Communications. The scientists carried out a host of computer simulations, tests on robots and experiments on Drosophila melanogaster - the most commonly studied insect in biology. 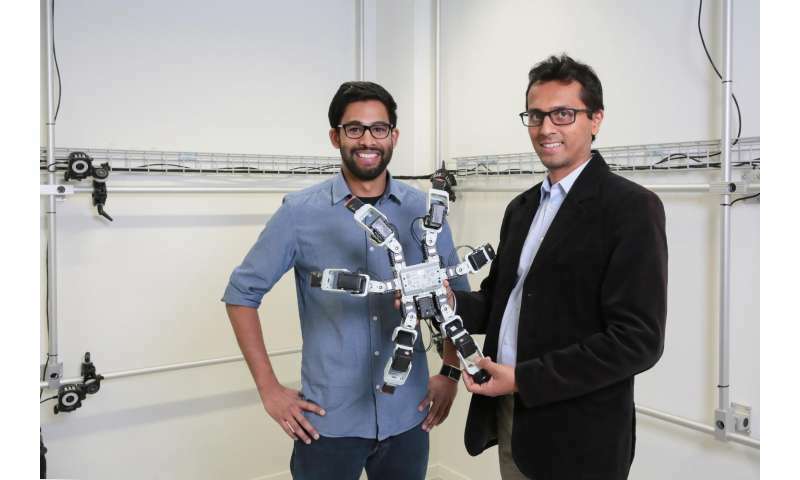 "We wanted to determine why insects use a tripod gait and identify whether it is, indeed, the fastest way for six-legged animals and robots to walk," said Pavan Ramdya, co-lead and corresponding author of the study. To test the various combinations, the researchers used an evolutionary-like algorithm to optimize the walking speed of a simulated insect model based on Drosophila. Step-by-step, this algorithm sifted through many different possible gaits, eliminating the slowest and shortlisting the fastest. The findings shed new light on problems for biologists and robotics engineers alike. The researchers found that the common insect tripod gait did emerge when they optimized their insect model to climb vertical surfaces with adhesion on the tips of its legs. By contrast, simulations of ground-walking without the adhesiveness of insects' legs revealed that bipod gaits, where only two legs are on the ground at any given time, are faster and more efficient - although in nature no insects actually walk this way. "Our findings support the idea that insects use a tripod gait to most effectively walk on surfaces in three dimensions, and because their legs have adhesive properties. This confirms a long-standing biological hypothesis," said Ramdya. "Ground robots should therefore break free from only using the tripod gait". 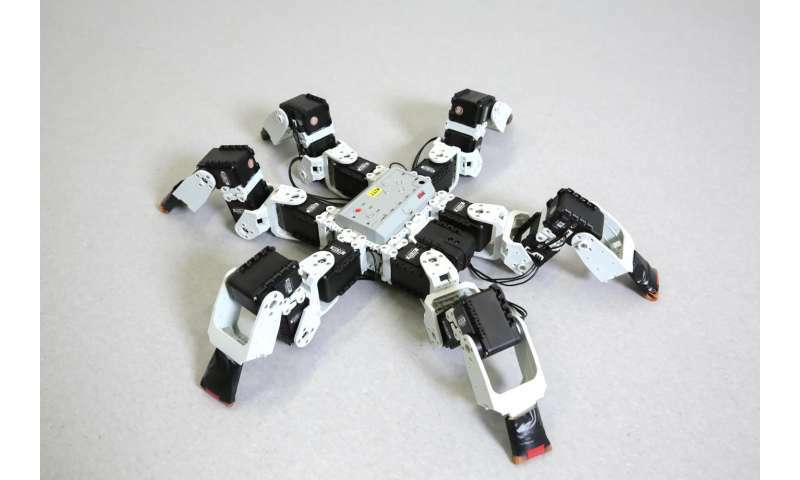 The researchers then built a six-legged robot capable of employing either the tripod or bipod gait. The bipod gait was again demonstrated to be faster, corroborating the simulation algorithms' results. Finally, the experimenters examined real insects. 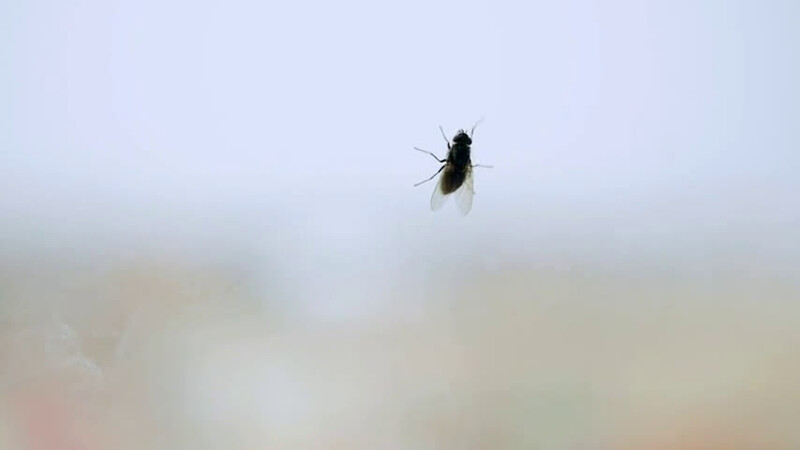 To see if leg adhesion might also play a role in the walking coordination of real flies, they put polymer drops on the flies' legs to cover their claws and adhesive pads - as if the flies were wearing boots - and watched what happened. The flies quickly began to use bipod-like leg coordination similar to the one discovered in the simulation. "This result shows that, unlike most robots, animals can adapt to find new ways of walking under new circumstances," said Robin Thandiackal, a co-lead author of the study. "There is a natural dialogue between robotics and biology: Many robot designers are inspired by nature and biologists can use robots to better understand the behavior of animal species. We believe that our work represents an important contribution to the study of animal and robotic locomotion." More information: Climbing favors the tripod gait over alternative faster insect gaits, Nature Communications, 2017.